The Dons have cultivated a formidable reputation for our coloring book prowess. So, when recent jealous whispers arose that USF had perhaps hit our coloring peak, we at Gleeson Library took them seriously. ONE MUST BECOME THE COLORING BOOK. The solution arrived in early February by way of the cutting-edge minds at the New York Academy of Medicine. NYAM and other institutions created curated coloring sheets. All imagery was sourced directly from their own internal collections giving community members a unique opportunity to engage with the work. Once a patron had finished putting their personal spin on whichever piece they had selected they were invited to share via the hashtag #ColorOurCollections. Needless to say, we turned our attentions to our own stacks. Our valiant journey through the library labyrinth spanned many ancient non-copyrighted volumes. There were monsters slouching around the periphery of monastic manuscripts, sharks immortalized in fossil form and dinosaur sketches from the earliest American digs. We returned victorious bearing these and other trophies. The pages we lay before you, dear Dons, are the fruit of our stacks. Take up your pencils. Your time has come. The American Library Association has held its annual conference in Detroit, Michigan on four different occasions. The first of these was in 1922 when ALA met from June 26 to July 1. The attendance at the conference totaled 1,839, and those individuals participated in thirty or more associations, sections and round tables which took place at eleven different locations. One of those locations was the newly completed Detroit Public Library’s main building. Conference attendees were also treated to a special day in Ann Arbor, Michigan where they were able to visit the new library building of the University of Michigan. A report on the conference in Library Journal for July, 1922 noted that this was the first conference where none of those who attended ALA’s first meeting in 1876 were not in attendance (although there were still nine survivors of that conference). George B. Utley took office as ALA’s 36th president at the conference. Utley had previously served as ALA’s Executive Secretary from 1911 to 1920. Among those in attendance was Sallie Lou (Mrs. Joseph A.) 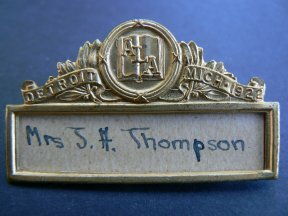 Thompson whose conference badge is part of my collection of librariana (see below). On June 27 the first Newbery Medal, for the most distinguished contribution to American literature for children published in the preceding year, was awarded to Henrick Van Loon for The Story of Mankind. A publicity committee at the conference recommended the establishment of a National Library Week, something which didn’t take place for another 36 years. At the conference Reverend Thomas Fountain Blue (1866-1935) who served as the first African American to head a branch library (Louisville Free Public Library 1905-1935) also became the first African American to give a speech before the American Library Association. 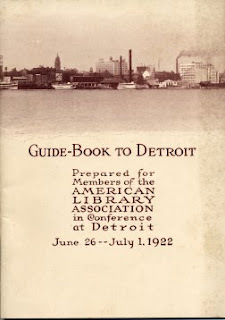 ALA did not meet again in Detroit until 1965. It also met there in 1970 and 1977, two conferences which I personally attended. The 1970 conference was especially memorable for me since it was my second ALA conference and my first as an employed librarian. 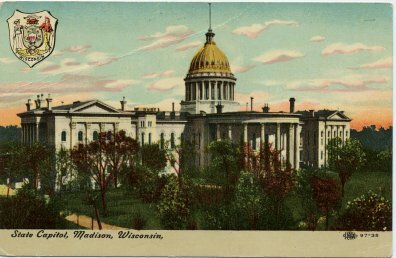 On this date 125 years ago a group of individuals gathered in the office of the Wisconsin State Superintendent of Public Instruction (located in Wisconsin's second Capitol, shown above) for the purpose of establishing a state library association. The Wisconsin Library Association (WLA) was the sixth state library association established in the United States. Planning by the 125th Anniversary Task Force, on which I serve, has been underway for months. A kick-off of the celebration for the library community took place at WLA’s annual conference in November of 2015, and a public kick-off occurred earlier this week in the State Capitol in conjunction with Library Legislative Day. A culmination of the celebration will take place at WLA’s 2016 annual conference in October in Milwaukee. The entire Wisconsin library community has been invited to participate in the celebration which looks to the future as well as the past. A significant component of the celebration is content that has been and will be added to the Wisconsin Library Heritage Center website about the history of WLA and librarianship in Wisconsin. More static content can be found under the “WLA’s 125th” menu item on the website. Regular stories about Wisconsin library history will be added to the blog portion of the website. It is possible to subscribe to the blog stories to get regular updates.